What an amazing week racing against the best in the world. Here is a roundup of how we did, day by day. Things got off to a slow start as the weather gods had a small tantrum. Boat crews were reduced to eight for small boats and 16 for standard boats. Our Over 40s mixed crew finished fifth in the world out of 18 teams, beaten by teams from Germany, Russia, Hungary, and Singapore. We beat all the Australian, Italian, Polish and US teams. 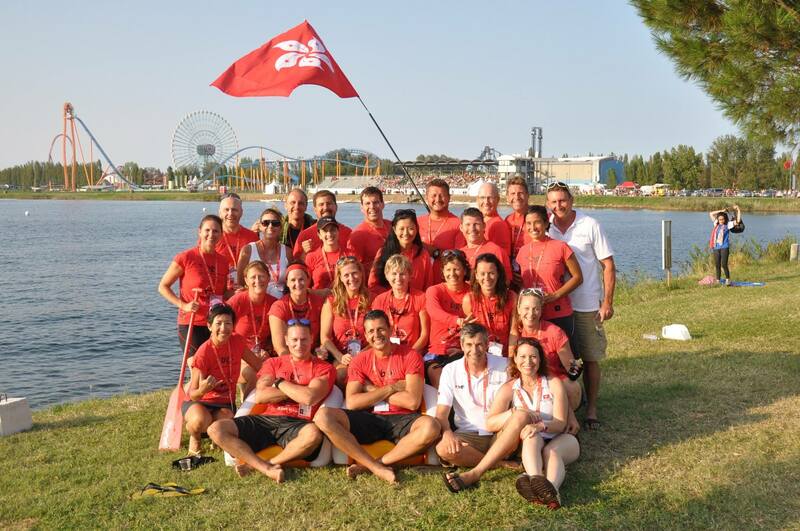 Our Premier Mixed Crew finished 10th out of 28 teams taking one important scalp, the Macau national team! The Ladies finished in eighth place out of a field of 21 and an intense and close race. The Over 40s found themselves competing against the winners of yesterday’s 2km, PG Mannheim. It was a fantastic race and we led right until the very last stroke to take second place, beaten by just two hundredths of a second. We beat PG Mannheim by half a second, and we were the fourth fastest team in the heats. In the semi final, we needed third place to make it straight through to the Grand Final and we were up against really strong teams from Russia, Hungary, and Germany. And we did it. For the grand final we scored lane 7, a tough lane. We led the race through the first 75 meters but we did not finish as strong as we would have liked and placed seventh. That’s still seventh in the world and Grand Finalists, so we’re not complaining. The Premier mixed performed admirably. They needed to take fourth in their heat and did exactly that in the 15th fastest time of the day. In the semi final we took sixth, again with the 15th fastest semi final time. This put us in the minor final. Based on our time, we were expecting seventh! But we got third taking us to the 11th placed team in the world. A fantastic rally for the final race. It was a much warmer and calmer day, and it was the women’s turn to go first. They were set the task of making the first four in their heat to make the semi final. They did, with the 14th fastest heat time overall. They knew they needed to up their game to make either the grand or minor final and they did but had to settle on a place in the minor final, in which they placed sixth. There was some stiff competition and this was a result to be proud of, especially as the women’s captain was not able to paddle that day. The boys new they had a very tough task ahead, but buoyed by our finals appearances the previous day decided to give it everything. They needed 4th to avoid the reps and after an intense battle with the Iranian team pulled it out of the bag, making the semi final. In the semi final we missed a final place by two tenths of a second. It was a great run and with a small squad at our disposal we took pride that we were competitive in a world class field. In our semi final, which we needed to win for a straight path to the final, we had the lead but were nosed by a tenth of a second by the Australians from Manly. We had to wait to see if we would get through on a fastest loser time. And we did. Not only that, but it was the second fastest semi final time of the day. There was much jumping up and down when we found this out! In the Grand Final we ran second for the first half of the race but in the end had to settle for 6th, one second away from a medal. Some of our crew were also doubling up in the mixed and were running their 5th or 6th race so fatigue had clearly set in. But sixth in the world? We’ll take it. The Premier Mixed (we call them The Kids) started off with a tough draw, needing a top four finish to progress to the Semis without having to rep. They finished with the 18th fastest time of the day out of 32 crews but placed fifth so they had to run the extra race. Knowing that the Over 40s final was approaching, and with a limited crew and only two reserves, we rested one of our strongest paddlers, Jim, and the crew understood that the rest that were doubling up would take the edge off to save something for the Over 40s race. The team commitment in accepting that decision demonstrated the very best in Stormy Dragons team spirit. The crew came 7th in the semi final, and then comfortably won their tail final. It was nice to see the Stormys name emblazoned on the big screens in the crew rest area. The ladies began the day with a tough heat and had to compete in the reps to advance to the semi finals. With the bare ten girls and no reserves they took third in the rep and were placed in the minor final. By the time of the final, and after 5 days of racing, everyone was clearly tired and the girls placed 6th, making them 14th in the world. The boys had to make top four but were pipped to fourth from the outside lane by Iran. We needed to win our rep so we decided to do it in style, rest one of our boys and put a girl in. We won our rep! In the semi final we needed to make top 6 teams in terms of time, but we were seventh and so our competition came to a close. With just 10 boys and 11 girls, and only one dedicated steers and drummer, the results we managed to achieve were outstanding. Especially compared to one Canadian team wth 125 members of which 101 were in Italy. Well done to everyone. And roll on Adelaide in 2016.